Even though excavations revealed that Japan had sanitary toilets over fifteen hundred years ago, the Japanese toilet basin lavatory was only introduced after the Second World War. Back in 1923, a devastating earthquake in Tokyo pointed out the importance of plumbing systems in controlling the spreading of disease. Despite the fact that most citizens continued to use the traditional squat toilets even today, soon enough the Western style seated toilets started growing in popularity. Not only did they starting installing the seated toilets in both household and public places, but they also included unique features for extra conform. Whilst in Japan, tourists are prone to find restaurants and hotel rooms that are using the classic Asian toilet, also known as the squat toilets. 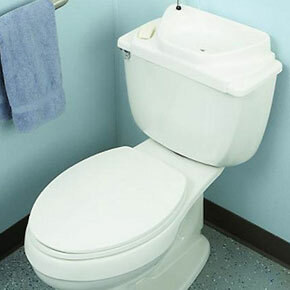 Even though the fixtures of this toilet are similar to those found in Europe and North America, the construction and the method of usage are completely different. Overall, these lavatories resemble a urinal, and in order to use it a person must crouch facing the wall. Whilst they employ water to eliminate the waste, the amount of water used is significantly lower. One of the biggest advantages of the squat toilets is that they are considered more hygienic, as the person does not have direct contact with the seat. Even though tourists and foreigners will find this position uncomfortable, the Japanese physicians claim that crouching is a great way of preventing incontinence in women, as this posture strengthens the pelvic muscles. The Japanese toilet basin explored! As if the current features were not enough, the manufacturers also include some specific Japanese accessories, such as the Sound Princess and the toilet slippers. Whilst the first accessory is meant to mask the sounds made in the bathroom and it is designed especially for women, the slippers represent a cultural aspect of Japan. As being clean for the Japanese is an equivalent to being beautiful and healthy, a person can easily notice the link between their culture and the need for extra hygienic toilets. In the near future, manufacturers intend to introduce medical sensors to the Western style toilets, so that anyone can know his body fat, sugar level, blood pressure and pulse just by using the Japanese toilet basin for its intended purposes. These measurements are supposed to be sent to your physician for analysis via a device connected to the internet.